The use of a vehicle for transportation is an important part of a person’s participation and engagement with the community and for living an independent life. Reduced strength and restricted body movement can cause challenges to getting in and out of a vehicle safely. Car transfers are complex, physically demanding and are known to provoke back and shoulder pain in a wheelchair user. This is most likely due to the need to support the body across the gap between the wheelchair and the car seat. In addition, car seats are often higher than the wheelchair itself, thus increasing the load on the body to support itself. Transfer Handles: Portable transfer handles that fit into the door striker on the door frame provide a strong hand bar to hold on to. Large grips provide optimal leverage for vehicle transfers. 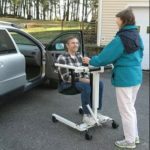 Sliding boards: A sliding board bridges the gap between two surfaces such as from a car seat and a wheelchair without requiring any lifting by the caregiver. Some models incorporate a disc that slides along the board minimizing friction between the user and the board. Portable Swivel cushions: This consists of a circular rotating cushion over a flat base and can assist a user to pivot with or without the assistance of an attendant. When placed on a car seat it can help rotate and swing the legs into or out of the car. Leg Lifters: The leg lifter is for people who have difficulty in raising their legs or with restricted lower limb mobility. The lifter can assist in re-positioning the legs and feet while transferring. It has two loops, one for the forearm or to be grasped by the hand, and the other over the foot or upper leg. 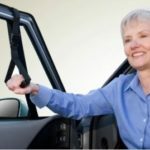 Transfer straps: An adjustable strap attaches to the vehicle window frame or grab handle above the window provides a hanging handle for the person to grab on to while moving in or out of the car. It is made out of sturdy, non-slip material and is easy to install and remove. Swivel seats / Turney: A swivel base can be attached to the existing seat enabling the seat to be rotated 90 degrees so that it faces outside of the vehicle. The seat is powered and swivels itself out of the car eliminating the need to step into the car. It gives the user greater space to transfer on the seat before it moves the passenger back into the car. Wheelchair Ramps: A ramp is an inclined plane that allows a wheelchair user to roll the chair into the rear or side of the vehicle. It is important to measure the vehicle’s door width and height from the ground while considering a ramp for the vehicle. Vehicle lift: A lift is permanently installed onto a vehicle. It lifts the wheelchair off the ground and places the chair on the floor of the vehicle. This type of equipment is normally installed on the side of a van or large vehicle or at the back if there is a rear van door. Sliding mats: Two separate mats made of slippery fabrics are placed on top of each other and allow for easy manoeuvrability. They come with handles that provide the caregivers to hold on to while re-positioning the individual in the car. Transfer plates: A flip-down transfer seat securely attached to the vehicle acts as a bridge between the wheelchair and the car seat. The user is able to easily stow it away while not in use. Hoists: A patient hoist can lift the person in a comfortable and dignified manner to be securely placed inside the car. Some models fit easily in the trunk of the car without the need for disassembly and can be folded up in seconds. It maybe user or attendant operated and can be manual or electrical. Wheelchair accessible vehicles: Wheelchair accessible vehicles have come a long way thanks to innovative automobile design and mobility equipment advancements. They are ideal for wheelchair users to achieve their sense of independence. They come pre-built with modified chassis’, doorways, wheelchair ramps or lifts and interior seating arrangements. Using any of the above devices will enable people to smoothly transfer from a wheelchair to a car and will help to become active and engaged socially.